and all manner of spectres roam the night! Halloween is the official season of the Pumpkin, and we’ve brewed two delectable versions of this Fall favorite! 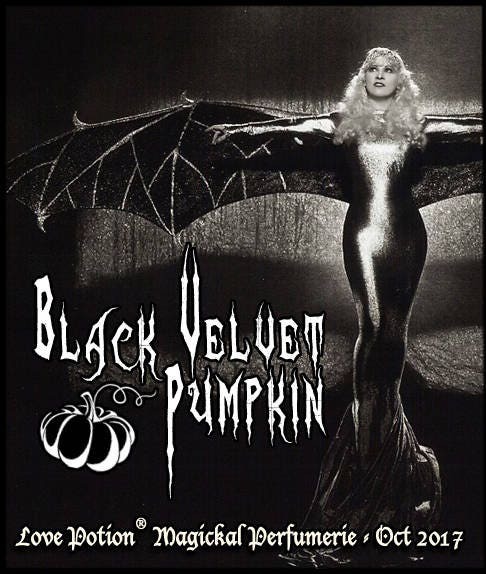 Our darkly delicious Black Velvet variety features a richly spicy blend of pumpkin accords darkened with black coffee plus a mysterious blend of aged patchouli, vetiver and Arabian wood attars, then sweetened with sticky caramel and maple syrup and infused with just a touch of woodsmoke for extra Autumnal ambiance. PUMPKIN ~ Fertility, plenty, abundance, prosperity. Male sexual stimulant. COFFEE ~ Focus, stamina, concentration, determination.